In many instances we are called upon to solve problems with water pooling or just saturating one area of a yard. We will be showing one way of solving these problems with the aid of the photos below. First locate a catch basin somewhere on the property. You might find one on the neighbor’s property, in which case, you will need permission from the neighbor to access it. Check with the local authorities about tapping into it. 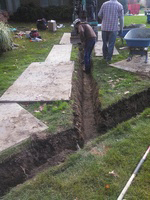 Call Miss Dig to locate any underground utilities. Once you have gotten permission, core drill a 5 inch hole into the catch basin low enough so that any drain pipe you install will have sufficient pitch for the water to drain. Start with using a short piece of 4” diameter schedule 40 pipe and insert it into the 5” hole you have made. 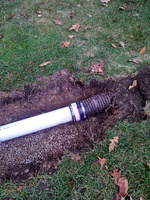 Only allow the pipe to extend into the catch basin about ½ to ¾ of an inch, just enough so that you can cement around it. This will prevent any ice in the winter from pushing up on it. Cement around the pipe on both side of the catch basin where it enters in. On the other side attach a 4” Fernco to allow connection of your 4” sewer and drain pipe. 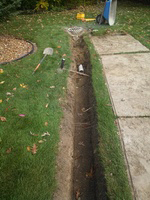 Use a piece only 4 or 5 feet long without drain holes. This piece of pipe should be angled so that water will enter the catch basin rapidly. Now you’re ready to determine where to put the drain pipes. 1. Look for the areas that are ponding or saturated the most. 2. 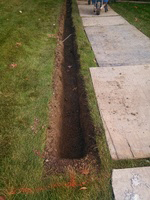 Mark where you want the pipes to be buried by using a string line and marking paint. 3. Cut the sod 9” from the center of the trench on both sides, rolling it up for use later. Place in a shady area and keep watered. 4. Put plywood down along the trenching area to provide protection to the existing sod from machinery and foot traffic. 5. Dig a trench 18” wide and about 16” deep. 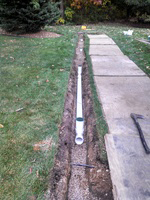 Installing the perforated sewer and drain pipe. 1. We prefer to use “sewer and drain pipe” because it has no corrugations for dirt to get caught up on and it’s easier to lay flat and adjust pitch. It does not require a sock on it that can get clogged up in time. 2. 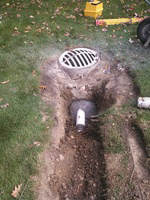 The perforated sewer and drain pipe has holes at 5 and 7 o’clock, meaning you will want to put the holes down towards the ground. When the water rises it will come into the holes and fall into a channel created between the holes now allowing the water to flow to the catch basin. 3. 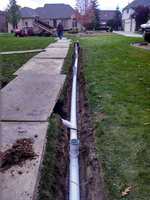 Install the pipe so that there is a slight pitch back to the catch basin. You may achieve this by putting just a slight amount of pea gravel under the pipe. 4. Every 10 to 20 feet install a “T” enabling the use of a green grate. This will allow the majority of water to enter the pipe rapidly and any residual water can eventually seep into the pipe thru the pea gravel. 1. Back fill the pipe with either pea gravel or 6A cobble stone. 2. Back fill just high enough so that you have room left for topsoil and sod. Finishing the job with sod or seed. 1. Install filter cloth over the stone so that the dirt won’t mix with it. 2. 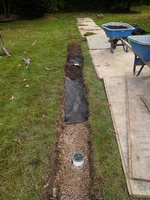 Put topsoil on the filter cloth, just enough for the sod or seed to grow, about 2 inches. 3. Install your sod or seed and tamp it or roll it. Other options. You might what to consider tying your downspouts into the system as well. Click on any image thumbnail to enlarge... then click again to hide it. We can provide ways to move water away from your home.